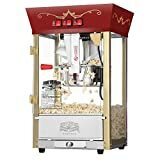 Why should you purchase a popcorn machine? Popcorn is both a tasty and wholesome snack, which is popular among adults and children alike. Popcorn is a nutritious and low-fat food—a great alternative to the sugary or greasy commercial snacks that you see on the market. 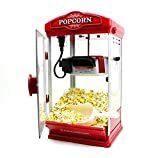 If you want to enjoy some fresh-popped popcorn in the comfort of your own home, there are a number of affordable, small popcorn machines available on the market. 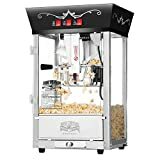 After reading thousands of on-line reviews, we have listed some of the factors that you need to consider before buying a popcorn machine. What should you consider when buying a popcorn machine? Countertop or stand-alone: Check whether the popcorn machine is a counter-top or stand-alone model: This will give you an idea about the amount of space that it occupies. Countertop units are usually smaller than the stand-alone ones. A stand-alone unit is in the form of a cart, rather than just sitting on your kitchen counter. Kettle size: There are different types of popcorn machines available. 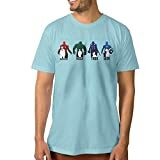 Each one has a different size or capacity. The size is usually measured in ounces. There are kettles available in the range of 4 oz to over 31 oz. A 6 oz kettle is adequate for a big family, while a smaller family can make do with a kettle of 4 oz size capacity. Wattage: You should check the wattage of the kettle to get an idea about its power consumption. A machine with greater wattage will consume more electricity. Check the popcorn machine reviews on-line to know the exact wattage of the product.